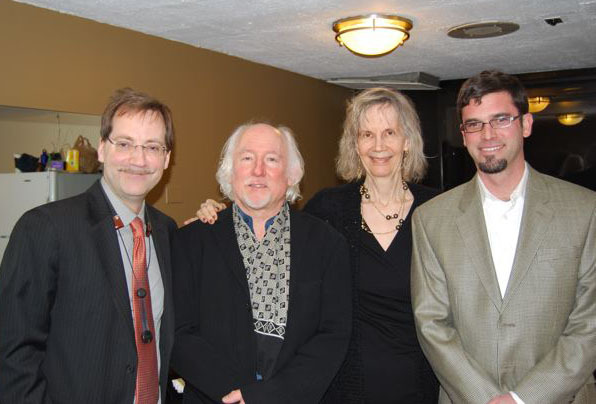 I am thankful to recieve the Berklee Distinguished Faculy Award along with colleagues JoAnne Brackeen, Greg Hopkins and Ross Bresler. This is a transcript of the the words that I shared on that occasion. I am honored to receive this award. I would like to thank my colleagues in the MT Division and the EPD department for their support and inspiration. I would also like to thank my Chair, Kurt Biederwolf for his help every step of the way. The degree to which I am effective as a faculty member is partially a result of the teachers that I had. I studied saxophone Joe Allard for three years. Joe was sought out by Bill Pierce, Eric Dolphy, Michael Brecker and many more. Everything that Joe said was extremely insightful, remarkably clear. He was very tough without making it feel personal. Now, thirty years later, I still think about what he said every time I pick up the horn. Later, I studied with composition Bob Brookmeyer for two years. Same deal. The critiques and ideas that he presented were always concrete, often tough, and assumed that you aimed to write at the highest level. Now, despite ten years of daily use, I have not worn out the advice that he shared with me. I also learn from colleagues here at the college. Not long ago, I watched visiting artist, producer and engineer Nathaniel Kunkle, lecture to one of my classes. He was as insightful, clear and frank as Allard and Brookmeyer. The students sat up straight in their chairs for the duration and barely seemed to blink. Afterwards, I watched students as they left the classroom and I recognized that look on their face. One student said thee words to me as he passed ... "I got it." I knew that this one brief encounter might have changed his life - the puzzle about how to move forward was put together. These teachers helped change my life. There is nothing more exciting to me than to help our students advance their work as artists, technologists and thinkers. Our connection might be long term, or simply one brief conversation. Either way it might be the tipping point where they grasp the compass that they will use for years to come. I am grateful to the college and for giving me the opportunity to do this work for our students and grateful to my colleagues for their support and for teaching me. The "Wandering Band" is a performance of vocalists and musicians performing on voice, piano, bass and saxophone wandering freely through the Gardner Museum. Conceived by artist Ana Prvacki, the Wandering Band artists will perform their daily practice of exercises, repertoire and improvisation while strolling through the galleries. Born in 1976, Serbia / Yugoslavia, Prvacki has earned considerable intermational attention in the last decade. In 2009, she was invited to participate in the show “The Girl Effect” at Lombard Freid Projects, New York and to create a series of performaces at Castello di Rivoli Museo d’Arte Contemporanea (Turin). She has performed in various international biennials (2008, Sydney Biennial ; 2007, Singapore biennial; 2006 Turin Triennale). She has also participated in group shows such as “25 Years Later: Welcome to Art in General”, New York (2007) . In 2010, upcoming invitations include the Pompidou Center in Paris (“Repetition”) , the Isabella Gardner Museum (Boston) and MONA Tasmanis. Neil Leonard - "Dreaming of an Island"
The Berklee Contemporary Symphony Orchestra presents the Boston premiere of professor Neil Leonard's multimedia work, "Dreaming of an Island". Neil writes, "'Dreaming of an Island' revisits ideas that I first explored in video/installations with Maria Magdalena Campos-Pons. Our work focused on ancient cultural themes, and their impact on contemporary personal narrative. "The score for 'Dreaming of an Island' draws on West African Yoruba music that Campos-Pons heard as a child in Cuba. Yoruba folkloric melodies and rhythms are heard in combination with ideas from 21st century concert music, electronic music and jazz. The video projection for Dreaming of an Island is a montage created by myself and Magdalena Campos-Pons using a software system of my own design." Castello in Movimento at Castello Malaspina proudly presents the world premiere of a site-specific work featuring large scale video projection and electroacousic sound performance by Berklee College of Music's InterArts Ensemble, directed by Neil Leonard, and students of the Folkwang Hochschule, Essen, Germany. The twenty-minute piece will feature several of Berklee's most outstanding students performing on laptop and processed instruments: voice, electric bass, saxophones. Top students and faculty from the Folkwang Hochschule will project interactive video of processed imagery mapped to the castle’s exterior. Teatro Museo Nacional de Bellas Artes, Arte Cubano. MEREDITH MONK: INNER VOICE (by Babeth M.VanLoo) As part of the ICA’s ongoing commitment to presenting the best film of art and artists, the ICA features a new documentary about Meredith Monk. A “musician of boundless imagination and vision,” (The Plain Dealer) Monk is a composer, singer, director/choreographer and creator of new opera, music theater works, films, and installations. Inner Voice follows Monk as she creates her latest piece, Songs of Ascension, a major new work developed in collaboration with renowned artist Ann Hamilton. The film observes Monk’s process from her initial, solitary work to the rehearsal process, seeking the motivation and source of her creative force. Neil Leonard - sound for multimedia installation "My mother told me that I am Chinese"